In this episode, you’ll learn about how to stand out in a crowded market from choco-preneur, Ryan Novak. Ryan is the owner of Chocolate Pizza Company, central New York’s largest gourmet chocolate manufacturer. Starting as a dishwasher when he was 15 years old, Ryan had a vision to grow the business into a national brand. In 2010, at age 21, he became the owner, and has seen the company grow dramatically. He is a graduate of Syracuse University, with a bachelor’s in entrepreneurship and emerging enterprises, and was a placekicker for the Orange football team. Novak is a 40 under 40 award recipient, and his company was selected by Centerstate CEO as business of the year in 2016, for companies under 50 employees. He lives in Marcellus with his wife, Christy, and enjoys travel, history and running. Hey awesome, glad to be here. Thanks for having me, Nicole. I’m really looking forward to our conversation. One of my favorite topics is chocolate so let’s dive right in! Give us some background on how you got started in the world of chocolate. Chocolate Pizza Company was a small, local chocolate shop when I was a kid growing up. When I was younger, my Mom would take me over to the store and I’d sample the chocolate. Those memories stuck with me. My mother was killed by a drunk driver when I was nine years old, absolutely shattered my world, turned everything upside down. My Dad and I made it through together somehow. When I was 15, Bonnie, the owner of Chocolate Pizza offered me a job as a dishwasher. From there, it’s just evolved into a great passion and belief that this gourmet chocolate company really had the makings of something that could be special. My last year at Syracuse University, Bonnie was ready to retire. So at age 21, I became the owner of this business. My first year, I slept in the warehouse. I slept in the office there, trying to finish school – it was crazy. I was getting a degree in business while I was trying to run a business. It was a huge push behind me, knowing that I wanted to make her proud, and I wanted to make my time here valuable, and do something for a change, to do something good, and I really had that backing behind me. I know how bad things can get, so when I don’t get a customer or an order falls through, or somebody doesn’t get what they were hoping for, I mean we know what a bad day is, and that really helped us propel our business into accepting the good for what it is, and the bad and trouble for what it is as well. What grit you have to have 21 years old, jumping right in, but still wanted to finish your degree. I’m sure it’s paid off, having that degree behind you as well. The facility that you built, can you talk a little bit more about it? I’ve had a tour of it, but you built it not only for your production capabilities but also with the idea that folks would want to come and see how the delicious products get made. Yeah, absolutely. The original location was just a small, 2,500 square foot space, where the store and the production facility were completely separate. You could come into the store, but you couldn’t see where anything was made, or interact with the chocolate. When we designed the layout for this building, we wanted the store in the middle, so you could see the kitchen. We have a big viewing window that shows right into our production facility, where you can see our tempering machines. 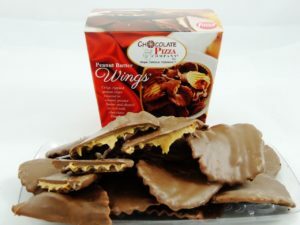 You can see hundreds of pounds of chocolate being melted, and the different people working back there, making chocolate pizzas, peanut butter wings, different products like that, so we wanted it to be interactive and fun. Is the chocolate itself made onsite? Absolutely. A lot of people didn’t realize that yes, we actually manufacture this right here. It was a surprise for some of our longtime customers, who didn’t know. For them to be able to see the window, and see the kitchen and the chocolate, and all the experience and everything happening back there – that’s exactly why we designed the space this way. I think that’s great. Not only that, but you built it in such a way that you’re able to accommodate buses, correct? Absolutely, yeah. Buses have been a great part of this new facility. We bring bus tours from all over: from Pennsylvania, Massachusetts, all over. They come for the Finger Lakes area, and then they like to add a fun sweet stop at the end of their trip, and they get to come see NY’s largest chocolate manufacturer, and it’s just kind of a great place for them to stop, visit. We bring out a full sampling tray, where they can try all the different chocolates we make. We have a video presentation that has some of our clips from Food Network, the Today Show other appearances we’ve made. We interact with them, and they can see them making the pizzas, so having that bus has been a huge exposure for us. The facility build already tells us a lot, but I’m wondering what else you have done to stand out from the crowd? Sure – we have this great concept that we really just try to run with – the highest quality gourmet chocolates you can get, with a fun twist. Rather than just doing a truffle or some highbrow whatever, we made a chocolate pizza. We went out there, we trademarked it. We own the segment “chocolate pizza” so it’s not your everyday chocolate shop. Really, to stand out, we just stuck with that high-quality chocolate and mixed it with a fun, unique chocolate experience, so that really helps us stand out from the everyday chocolate shop. Can you describe the pizzas and what’s on them, and then also for our listeners, describe the wings because I think the pizza wings are, it’s just a really cool combination. Yes, our pizzas are gourmet milk or dark chocolate, and then we make a homemade English Toffee, blend that into the chocolate, pour it into pizza pans, and top it with all sorts of different candies, nuts, anything you can think of. When we started, it was just the plain pizzas with nothing on it, or nuts. Now we added chocolate gems, we do peanut butter cup toppings, we do our candy avalanche pizza, which has everything you would grab on a Halloween threw on top of the pizza. It’s been a number one seller for us for years now. Our peanut butter wings, we paired to go with the pizzas, so you can have a pizza and wings. We take a potato chip, cover it in peanut butter, and then dip it in chocolate, and it gives you that peanut butter wing, the potato chip, peanut butter chocolate, just an out of this world experience. People just go nuts for the wings. They’ll drive hours to find them, or have us… we ship with UPS, so we can get them right to them, but the wings are just an incredible product. I’m wondering if there’s another example that you might be able to share, about how creativity can really help in the face of adversity. Is there a particular challenge that you’ve faced, and a creative solution that came from that? It’s a very crowded marketplace, for sure. We compete against high-end chocolate companies, the Godivas, the Lentz. So how were we supposed to compete during the holidays? Our holiday business, we go right up against Harry and David for the unique gift baskets. We personally work with everybody. We do a lot of custom gifts for our customers. 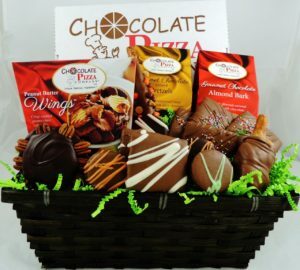 A lot of the bigger chocolate companies won’t do custom gifts just because they’re so big, and they can’t handle certain things, so we try to be creative and work with the customer, and give them something that they’re not going to find anywhere else. So we meet the challenge by being big enough to be responsive but yet still having that small feel, has really helped us grab a good piece of that holiday gift market share. That’s a great example! I know your distribution is pretty broad. You’re in some pretty good retail outlets. Can you talk a little bit about how that all came about? When I first started, the best way for me to get out there was basically going door to door to specialty stores. I’d go in and say “Hey, I’ve got this chocolate pizza product. I think it’s a great fit for your winery, or for your gift shop. How about selling them here?” From there it just kind of snowballed. We moved on to Hallmark, we did a trial for Hallmark, and became, our Peanut Butter Sparkler became their number one selling impulse item at their cash wrap. 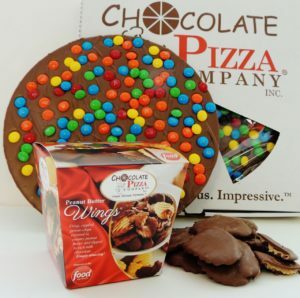 Last fall, we got an order for 31,000 chocolate pizzas from BJ’s Wholesale Club. They wanted a custom pizza, so that put us in 17 states, 215 BJ’s stores, and it just blows the lid off of everything you can do when you’re making 31,000 pizzas. It’s all about growing the brand, and it’s getting more and more people accustomed to seeing chocolate pizza. Is there something that you’re working on in the future that you’d like to share with us, something you might be particularly excited about that’s coming up? We’re really just upping our online presence. We’ve seen such a huge growth in who we can reach, and who we can target with our website, and driving traffic to our store as well, and then really just growing our website. We’ve gotten orders from six continents. We ship all over. We ship worldwide and just continue to grow our website. We did a redesign last fall, which has really given us great results. Continuing to pump that online presence is huge for us. What kinds of tactics do you use for your online presence? We do, yeah. Facebook marketing is a huge driver for us of traffic. We can really target who we want to see our ads and get the right kind of customers in the door. We can go local and really help drive tourism to our stores, which is fantastic. We can really do a great business nationally with that Facebook marketing. Instagram’s a huge up and coming thing. A couple years ago it was nothing, now it’s probably our second largest driver of traffic, and then just continuing to do different, and a little bit of pay per click and some other ads like that. Off-air, you had mentioned a recent TV appearance – so are you finding that the media, whenever you get in media, that really adds a lot of momentum to your business? It’s huge. We were on CNBC the weekend before Valentine’s Day, and just the explosion of when people hear the story, they see the chocolate. They see the excitement. People just love it, and they go online. We saw five times the orders this Valentine season, and a lot of that can be attributed to that CNBC appearance. One of the things I’d like to hear about is how you work with your local tourism office because I know you have a good relationship with them. How does that fit into what you’re accomplishing as a business? Oh, it’s fantastic. We work with both Centerstate CEO, serving greater Syracuse and the wider region. They connect us with bus tour groups, give us ideas on marketing. We work with Visit Syracuse as well. They brought us into their shop in Destiny Mall. That’s huge for us with the volume and traffic they get.. A ton of tours comes into Syracuse, or to Skaneateles every year, and if we can continue to let people know that, “Hey, there’s a nice, large chocolate shop right down the road,” it drives traffic our way. I love to explore collaboration between businesses. I’m wondering if you have any examples, or stories that you can share, of a time when collaboration has really worked for you? Absolutely! The Beak & Skiff Orchards are just down the road from us. They attract a huge number of visitors every year, every summer and fall. Working with Beak & Skiff has just been huge for our business and our brand. They’re great to work with. They’ve really built some great facilities, making it quite the experience that just brings in traffic from all over. Having us be their featured chocolate in the gift shop there has just been huge for us. Working back and forth with them has just been incredible. A lot of people will come down, they’ll grab a drumstick or a slice of pizza up at the Beak & Skiff, and then they’ll come on down and see our facility, and see the chocolate, and then we’re always sending people up to Beak & Skiff. Working with them and collaborating with Beak & Skiff has been fantastic. Can you provide some advice to our listeners on how they might go about looking for partnerships? What kinds of things do you look for when you’re thinking about finding a new collaborative partnership? Yes, for us, it’s all about finding the right people, just working with the right people and having the same vision for promoting Central New York. We’re trying to promote great products. We may compete in the gift market, but we offer different things, so partnerships and collaboration work as a win-win. Well, that’s just awesome. I really appreciate you being with us today, and we’ll talk to you again soon. Thanks, Ryan. Yeah, thanks so much, Nicole. Great to talk to you.